MIAMI - Cellphone video shows a group of friends from Miami just minutes before the group went out on a river in Costa Rica for a rafting excursion. It was the last video and photo the bachelor party would take together before the rafting trip claimed the lives of five people. Ernesto Sierra, Andres Denis, Jorge Caso and Sergio Lorenzo, all from Miami, were in Costa Rica celebrating groom-to-be Luis Beltran. The group of 14 was rafting Saturday in the Naranjo River when the three rafts they were in capsized. Local 10 News was told weather was to blame. "They (survivors) said when they entered the water everything was normal, but behind them came a flash flood," witness Marvin Vargas said in Spanish. All of them struggled to stay above water. Unfortunately, five people, including the guide, Kevin Thompson, did not survive. In a statement, members of the families of the victims and the survivors themselves said it part, "Most of us were ultimately able to grab hold of rocks or barriers in or around the water and await the rescue teams to get us. Unfortunately, not all of us were so lucky. Four of our dear friends drowned in those waters. Luis, the man we hoped to celebrate all weekend, lost a brother and we all lost four great friends during this vacation which went horribly wrong." Relatives of Sierra said his parents are in Costa Rica working to bring his body back to the U.S. He was just 25 years old and an only child. Denis, meanwhile, was described as the best friend to all and was just a week away from proposing to his girlfriend. 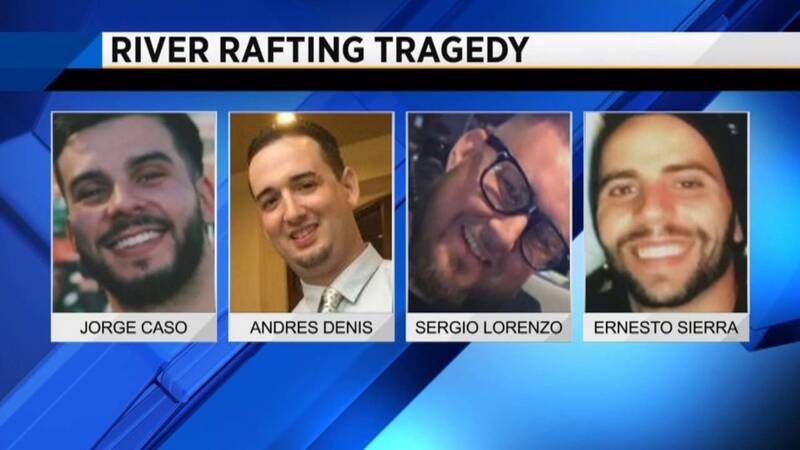 Sean Estevez, who was part of the bachelor party, told Local 10 the river was swollen due to heavy rain and the guides kept pushing back the rafting time but ultimately decided to go ahead with the excursion. A GoFundMe page has been created to help with the victims' funeral and memorial expenses.